Modern aluminium windows and doors are now often used in new commercial developments. 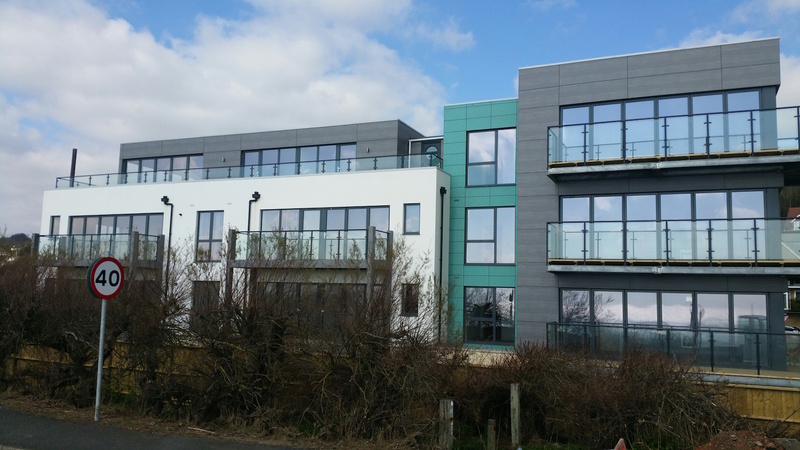 Our slim frame modern aluminium windows and doors feature highly in the character of this quirky new build development of flats in Hythe. The main contractor on this project has grown a good reputation for building good quality developments of flats across the South East over recent years. This was the first project we had worked together on, and the end result is what we had all hoped for. As with all commercial projects, this one started off as a pile of paper on our estimators desk at tender stage. As is often the case, a lot of the modern aluminium windows and doors drawn on the architects drawings were not going to comply with the fire egress part of building regulations, so we suggested the most cost-effective design changes that were necessary for the development to comply with building regulations. We could then get to quoting everything up. A couple of weeks after our first quote, the main contractor found out from his team that the windows and doors needed to achieve an overall u value of 1.4. A glazing u value measures the heat loss of any window or door. This link quite concisely explains what a u value is. Obviously in our times, energy conservation and efficiency has become very important. Our current quote had quoted windows and doors that would achieve a u value of 1.6, so a full requote with a new spec would be required. We had initially quoted using our Alitherm 600 windows with standard Planitherm Total Plus double glazed sealed units. To get the u value down further to where it needed to be, we re-quoted using our Smart Alitherm 800 window system with our Climaguard glass, which would get the modern aluminium windows and doors down to where the customer needed them to be. The requote did increase the cost by about £10k but that is what the main contractor so all of our hands were tied. The colour chosen in the end was RAL7015 matt, which is the grey colour you see below, which would match the cladding the main contractor was going to be using. We will be uploading more photos than below once all of the other works are completed on site but for now, the photo below will have to do!